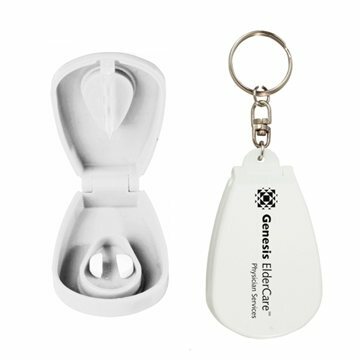 This 2-in-1 product features a pill box and pill cutter on a handy key chain. The pill cutter contains a plastic blade in the lid for child safety (keep in mind, this will not be as precise as a metal blade). This handy tool also contains an internal compartment that provides convenient pill storage. Makes a great handout for pharmacies, clinics, wellness fairs, medical conferences, health practices and more! Great item and useful. Cheap but practical giveaway item. Serves its purpose. They're perfect....precisely what I purchased! Ordering was easy and they kept in contact to make sure everything was correct throughout the whole process. the service is excellent! Rosa was over the top delivering ahead of schedule! Very nice professional looking.